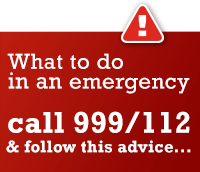 In the case of an emergency, the Galway Mountain Rescue Team can be reached by dialling 999/112 and requesting Mountain Rescue. You may be asked to give your location, so that the nearest Garda station can take the information and call out the team. Our press releases include information regarding any live search and rescue operations, and are used to inform our media contacts when the team has been called out to a rescue. These releases will provide you with time and location details along with regular updates of the status of the rescue.